WooHoo! 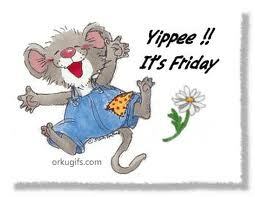 It's Friday again everyone! Where did this week go, right? Maybe it is just Me, but the week kind of got by Me this time. I got things done around the house mostly, a lot of laundry with everyone here, dishes, and the usual things. No time for creating this week, but hopefully that will come. Been kind of cold here. Trying to be warmer, it's spring, and I am anxious for it to get nice out. Actually really nice would be great! Hope the weather has been good to you where you are at. Here we go into the weekend again everyone. Any big plans? Not much for Me this weekend. Just day by day, and see where it all leads Me. Thanks for visiting with LilacsNDreams today everyone. Take care, have fun, enjoy your Friday, and have a super weekend!